Bivocational pastors could be the key for filling vacant pastorates in rural Kansas-Nebraska churches. 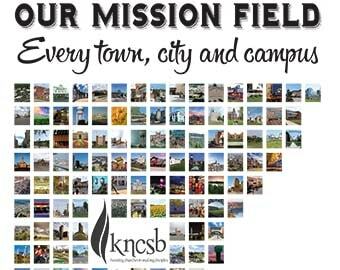 David Manner, KNCSB associate executive director, thinks it could be a “game changer” for rural communities. 1. It’s not a “pastor-in-waiting” position or a “side hustle.” Realize from the beginning that bivocational ministry is a calling and champion it. 2. Build a support team. For the Mayberrys, their first support team came from their “day jobs.” They were surprised how supportive co-workers were of them starting a new church. Once the church was more established, this support team grew to include members of the church and community. 3. Good time management. “You don’t have time to have your hands in everything,” Don explains. Pick the most important as defined by guidelines developed by the pastor and church. This helps church members understand that a bivocational pastor is not available 24/7 and that they will need to step in to help. 4. Delegate, delegate, delegate! It’s about delegating responsibilities and developing leaders. With a bivocational pastor, more people can become involved in ministry. The Mayberrys agree that their church members at Three Wooden Crosses are more involved and take ownership more than any church they pastored full-time. 5. Define boundaries. Set realistic guidelines for a bivocational pastor. This keeps everyone (church members, elders, deacons, and pastor) on the same page for expectations. Don’t stop there, though. Set boundaries for other duties delegated out to laypeople. Then, give freedom for people to operate within the boundaries. 6. Freedom. Bivocational pastors aren’t dependent on the church for their livelihood. There is freedom to be a bold leader for Christ because non-supportive church members do not threaten a pastor’s livelihood. This freedom can lead to healthier churches. 7. More opportunities for personal witnessing. Bivocational pastors are often seen as “regular working people.” They have more openings to share Christ because they spend as much time around non-believers as they do church members.